Adopting The Iran Nuclear Deal: What Does It Mean? : The Two-Way The Iran nuclear deal will begin to unfold in a series of steps that include nuclear cutbacks made by Iran and sanctions relief offered by the other countries. Adopting The Iran Nuclear Deal: What Does It Mean? 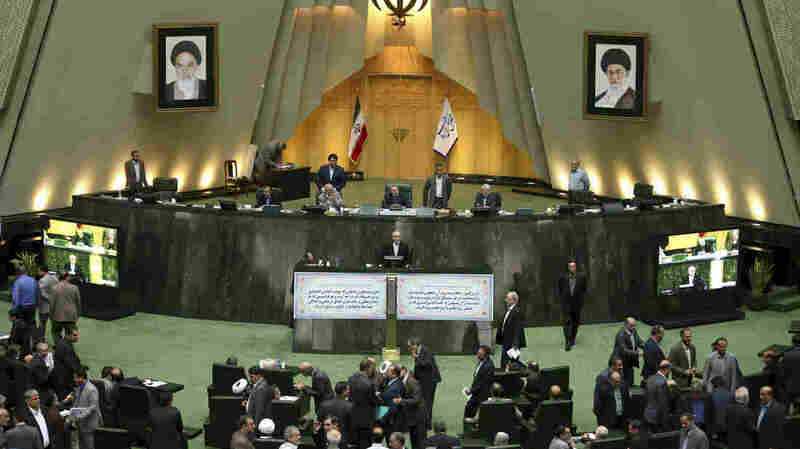 Head of Iran's Atomic Energy Organization Ali Akbar Salehi, center, speaks in an open session of parliament while discussing the bill on Iran's nuclear deal with world powers, in Tehran, Iran, Oct. 11, 2015. Starting Sunday, the approved nuclear deal begins being adopted and implemented. The Joint Comprehensive Plan of Action (JCPOA) will unfold in a series of steps that include nuclear cutbacks made by Iran and sanctions relief offered by the other countries. The phase that begins now is of special interest to nuclear non-proliferation experts. Those wanting to keep Iran, or any nation, from newly acquiring nuclear weapons will be very happy to see the steps Tehran has pledged to begin taking now. They will greatly shrink the capacity and scope of the Iranian nuclear program, in ways that sharply limit its ability to produce the kind of nuclear fuel that could be used in a weapon. Take out the core at the Arak heavy water reactor and fill it with concrete. The reactor will eventually be converted so that it produces only a minimal amount of the other main nuclear fuel, plutonium. This phase of the agreement should also see Iran answering long-held questions by the International Atomic Energy Agency (IAEA) about Iran's past nuclear activities. Last week, the IAEA announced that Iran had completed responding to IAEA queries on 12 such activities that could have possible military dimensions. The agency is due to report its finding on these issues on December 15th. The IAEA is also ramping up for a far more intrusive and high-tech inspection regime of Iran's entire nuclear fuel chain, from the uranium mine to processing mills to conversion and enrichment facilities. The goal is to permit IAEA inspectors to track every gram of nuclear material from start to finish, to ensure that nothing is diverted to a covert weapons program. Critics say the inspection regime, while stronger than the previous one, still has flaws and compromises that could allow Iran to cheat and move closer to weapons capability under the agreement. They point to a recent inspection of the controversial Parchin military site, in which Iranian technicians took environmental samples instead of IAEA inspectors. The agency says the procedure, while not routine, conforms to its standards. When Iran marks the nuclear deal with events on Monday, it will be focusing on the lifting of international economic sanctions that have depressed its economy, along with falling oil prices. But sanctions relief won't come until the IAEA certifies that Iran has met all its nuclear obligations. Once that happens, there will be another milestone, known as "implementation day." Iranian officials say they can complete the nuclear cutbacks by the end of the year, but western nuclear experts think it will probably be weeks, even months into 2016 before that happens. Critics of this agreement worry that Iran will use some of the money it receives from sanctions relief to further its regional ambitions in the already destabilized Mideast. The latest criticism comes after Iran tested a medium-range ballistic missile. A senior administration official says the missile test is a concern and a violation of U.N. Security Council resolutions, but it's not a violation of the nuclear accord. The official says the U.S. has "other tools" to address Iran's regional moves.